When you’re looking to save money, financial experts often recommend cutting expenses as the first solution. For most people, it’s pretty easy to look at your budget and automatically cut out the superfluous spending on non-essentials like Starbucks, dining out, clothes shopping, and maybe even gym memberships. But once you’ve cut out the non-essentials and see that you’re still not saving enough, you realize that you have to start reducing your expenses on the essentials as well. One of the biggest family expenses that could easily be seen as essential is the grocery budget—we all have to eat, right? In fact, financial experts often recommend cutting out take-out and dining out as one of the top ways to reduce expenses, which means that most of your meals will be coming from the grocery store. But how do you reduce your grocery budget? I found that I just didn’t have enough time to learn how to take advantage of coupons or even clip coupons to save money. 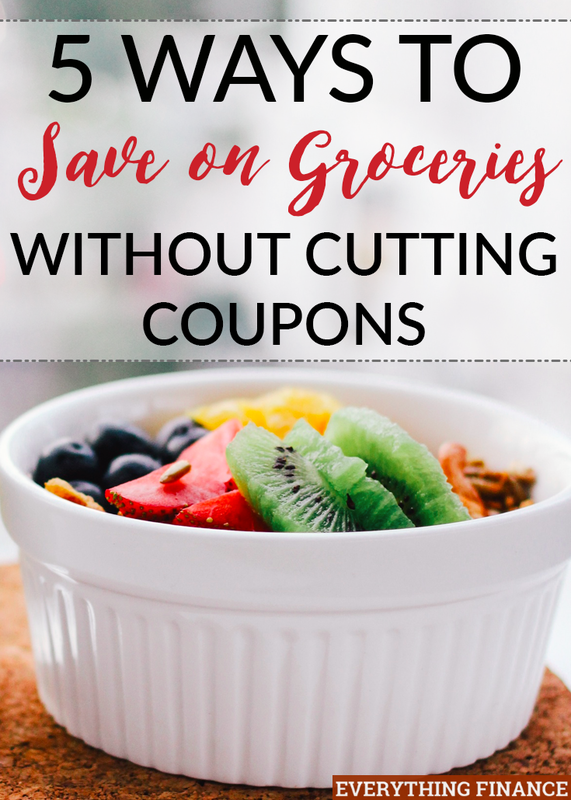 The cents I could save by clipping coupons were mitigated by the fact that it would take me lots of time and energy to cut those coupons in the first place. So I had to figure out other ways to save money on groceries without cutting coupons. Here are my top 5 tricks. Instead of making your grocery shopping list based on what you’re in the mood for that week, look at the circulars that are mailed to your house, or look for them online. Create your menu for the week based on what’s actually on sale at the store. For example, if pork chops are on sale, google a recipe for pork chops and base your meals around that. Always create your menu for the week before you go grocery shopping. This will help you know exactly what you need when you go grocery shopping. By using the weekly sales to create your meal plan, you’ll be maximizing your savings. Creating a meal plan will help you decide exactly what items you need. You should check your pantry to see what you already have, which will help eliminate buying excess items you don’t need. Try not to wander down the aisles that contain items not on your list, too. Pack up your dinner leftovers and take them for lunch the next day. Whenever I cook dinner, I always make extra so that I have a packed lunch for the next day at work. This helped me save money by not eating out for lunch, and it also helped me save money as I didn’t have to buy specific items for lunches. I could just make a little extra for dinner instead. Meat is notoriously expensive. But if you’re like me, you don’t consider it a meal unless there’s some meat in it. Instead of going full-out vegetarian, try to have a couple of meals a week where the focus of the meal is not on meat. Whether it be a pasta dish or a salad, try eliminating or at least reducing the need for meat in your dishes. Meal planning really helps – we cut down our monthly grocery spending by about $50 after we started meal planning at the beginning of this year. Using a cell phone app like Ibotta helps save money on grocery without the need for clipping coupons. I do that practice. I cook more for dinner so that I have either my breakfast or lunch the next day, but I usually do this thrice a week so because I want variety on my plate the next day/morning. But, this have been really helping me save me some money. What Summer Supplies Can You Buy Now to Save You a Ton of Money? I Want to Buy a Rental Property!